Bamboo & Green Tea Soap and Candle Set (P/N 16568). Preserve the environment with this eco-friendly, beautiful gift set. Fresh and gentle fragrances combine with recycled glass to create a natural and relaxing experience. The bottle-shaped liquid soap is a beautiful accent to any bath, with bright notes of fragrance and nutrients that are rich in vitamin E antioxidant. The candle blends fresh bamboo and soothing green tea scents and will burn up to 60 hours with a wonderful, natural fragrance. Made in the USA with all-natural ingredients, organic when possible, and recycled glass. Set includes 1 candle and 1 bottle of liquid soap. 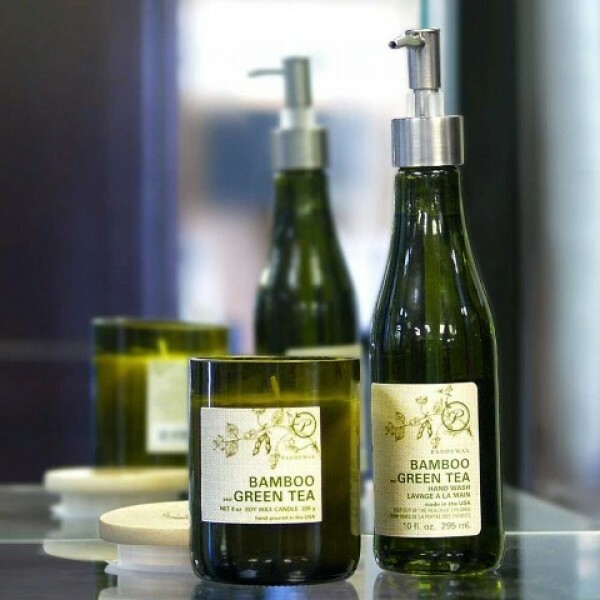 Fresh bamboo and soothing green tea fragrances combine in an eco-friendly gift set.